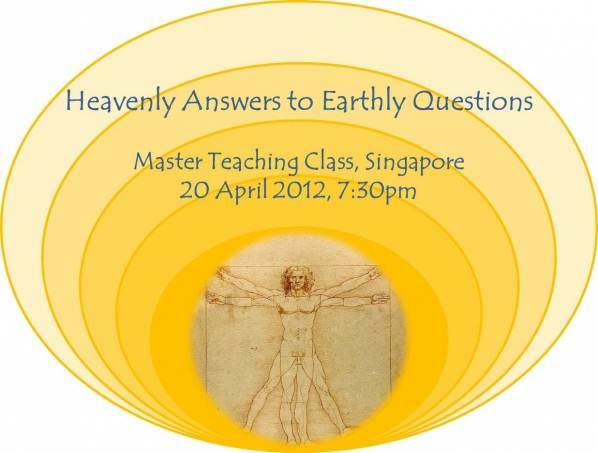 Recording of Master Teaching Class, Heavenly Answers to Earthly Questions 20th April 2012 – Now Available! At this New Moon event, we were gifted with the teachings and energy transmissions from The Elohim to activate the programming of Cosmic Time functionality within the Mind. There was also an insightful Q&A session hosted by Lord Maitreya, Planetary Christ and Head of the Office of the Christ. Read posts of 17 April and 21 April, and Event Invitation for more programme information. To have a fuller understanding of The Elohim’s teachings on Cosmic Time or Now Time, I recommend you listen to Judy Satori’s April 2012 Full Moon Transmission, available free of charge at http://www.thesoundoflight.com. Part 2. Q&A (9 Tracks, 50min). Go to Event Invitation for list of questions discussed. Please email anntay@acast.me with subject title Purchase Audio Recording and indicate your name. A Paypal invoice will be sent to you, followed by instructions on downloading the MP3 tracks.